How will Lotus’s cars of today evolve under Geely’s stewardship? Good news out of Lotus, of the kind that I suspect we should get used to in the short term: a new hiring. It takes less time to put people in place than it does cars into production, even under the stewardship of a company like Lotus’s Geely parent, which has recently transformed Volvo. Geely has just appointed Phil Popham (formerly of Jaguar Land Rover and latterly of Sunseeker) as CEO of Lotus Sports Cars and senior vice president for commercial operations of Group Lotus. If Geely’s plan with Lotus goes anything like it did with Volvo, which it took over in 2010, things will go a bit quiet barring announcements like this one. And then – boom – the model introduction will start. Volvo’s XC90 only went into production late in 2014 but, when a new V40 arrives next year, it’ll be the oldest car in a nine-model line-up. Popham’s appointment prompted some discussion among my colleagues: do people, aside from people like us, know what a Lotus actually is these days? It has been so long since it won an F1 world title or James Bond drove an Esprit that you wonder whether in the wider world people know what Lotus, which has been turning out brilliant-handling lightweight sports cars but for not enough money and in not enough quantities, actually stands for? Earlier this year, Geely’s take on where the firm was going was this: “Geely is fully committed to restoring Lotus into being a leading global luxury brand,” though it makes you wonder when, if ever, it really was one. I reckon anyone with the mildest of interest in cars has got a sound enough idea of what Lotus is: if you’ve heard of the company, you’ll know it makes sports cars. That’s enough, isn’t it? So it’s in metal, rather than wondering what the brand stands for, where my interest lies: the brand’s image will mould to reflect whatever type of car it makes. If it makes good cars, people will buy them, and the brand takes care of itself. I’m more intrigued about what these cars will be powered by. Lotus needs a sports car architecture, likely of its own to underpin its future sports cars and, presumably, another Volvo-based one for SUVs. But Volvo engines will only get it so far, given it doesn’t make any engines with more than four cylinders or 2.0 litres. And as we all know, Lotus makes sports cars. And some sports cars want more oomph than that. Surely there’ll come a point where Lotus is big enough that Toyota will be disinclined – especially given it likes making its own sports cars again – to keep supplying it engines, even if Lotus wanted to keep buying them; which, presumably, it would prefer not to. Which could mean pure electric or hybrid electric power, although that doesn’t always equate to lightness and fine ride quality, core themes of Lotus until now. Or has anybody tried the JLV-6G35 3.5-litre engine from the Geely Borui? Is there one, right now, on a rig in Norfolk, in preparation for being dropped into the middle of a new two-seat sports car? I suppose we’ll find out. And in the meantime, you’ll have to put up with people like me banging on about it for another three years. Where’s Lotus’s EV Sports Car....? Let's face it, I don't think there is much brand equity in the Lotus name (lots of trouble, usually serious), and £1.5 billion isn't a whole lot of investment for a range of cars let alone a single model. Sadly I think the future lies with a Lotus-branded Volvo underpinned SUV, together with Lotus tuned Volvo saloons. Mclaren with its high end sports cars have effectively taken over where Lotus gave up, and the more affordable sports segment is fast contracting and dominated by the Germans and Japanese. Phil Popham did a great job at Sunseeker which was a fantastic company that had turned into (if you will excuse the pun) a sinking ship! He turned the company around and it is doing well now. Lotus will be an even bigger challenge for him, and if he succeeds- will do his c.v. no harm at all. The world has moved on in Automotive terms, while Lotus have been treading water for god knows how many years....trotting out new amazing (and unfounded), plans for rejuvenation one after the other. Now I find it difficult to see where the demand is for Lotus to return. The obvious answer is for a stripped down back to basics fun weekender....but then Chunky Chapman sold the crown jewels to Caterham a long while ago, so that wont work.....Lotus always aspires to go up market - supercar status, but the name just wont carry them (especially with Chinese ownership and possibly mechanicals). So that leaves the middle market ...sort of GT86 to Boxter/Cayman...... not the biggest market in terms of units and a puddle already arguably overcrowded. They could of course sell their soul to the devil and produce an SUV! Chunky would turn in his grave. I think there is still room for lotus to go up against porsche, after all porsche has few sports car competitors, McLaren and Ferrari are way more expensive, bmw dips its toes against a boxter only so surely there is room for something to compete directly against porsche? Be even better if cheaper, ie a step up from gt86/mx5. Kind of the market it occupies now but with a wider more competitive range. Yup, it would seem like the quickest way to get money rolling in is to whip out an SUV based on Volvo architecture. I would presume XC60 size - XC40 is a bit small and at a price point where there's too much competition, XC90 is a bit big for a Lotus as a first offering. Base it on the XC60, make it good looking and sell at a price point just above the competitors to interest those who like others to know they pay a bit more. The sports car is a little more difficult. As has been said, effectively McLaren have moved into the space Lotus always wanted to be in, and are doing a good job of it. So Lotus need to go in below, which then opens them up to competing directly with the 911, which is where the Evora has always struggled. It's going to be extremely difficult to find their place in this market without platform sharing, but with whom..? As Geely have actual money to spend at Lotus, I would hope they are looking at Gordon Murrays latest iStream Superlight platorm as a base for its new range of cars. Their latest project is the T43 sports car which will be built in very limited numbers and the the platform will be available under licence for or sale. It can be easily scaled up so could underpin future Elise, Evora & maybe Esprit models. As for engines, as Geeley is a major shareholder in Daimler, Im sure this would enable them to access the engines from the A45 & A35 models which I think would be ideal in a Lotus. Although NOT compatible with their present phylosophy or product range, Volvo's "back-catalogue" does include their very own (Japanese designed) V8 petrol engine - to which (present supplier) Toyota could not object! Pretty certain Gothenburg could dust-off the plans, production machinery, and give Hethel a head-start in "tuning" that V8 for their own use in more up-market, profitable, vehicles; and as a complement to whatever (other) hybrid power-trains Lotus may wish to "borrow" from Volvo. The B8444S is a V8 engine developed by Yamaha for VOLVO. "Volvo began offering a 4.4 L V8 engine in its large P2 platform automobiles in 2005. It was initially offered only for the Volvo XC90, but later found its way in the second generation Volvo S80, and mated to a six speed Aisin Seiki transmission of Japan also with a Swedish Haldex all wheel drive system AWD. 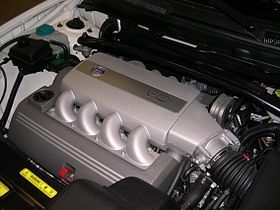 The 4.4 L V8 Volvo engine was built by Yamaha in Japan under Volvo design and specifications.The engine was unique in Ford's wide range of V8 engines in that it is designed for transverse use and has a V6-like 60° bank angle. Officials of all three companies involved insist that the Volvo V8 is not related to the SHO engine; the die-cast open-deck aluminum Volvo block is clearly different from the sand-cast closed-deck aluminum SHO engine block although the two engines share many common dimensions including bore centers, stroke, bearing journal diameters, and deck height. As revealed in BBC's Top Gear show (Series 14 Episode 5) this basic engine is also used in the Noble M600, albeit longitudinally mounted, developing some 650 horsepower with the addition of 2 turbochargers. The Noble unit is custom built by a 3rd party firm expressly for Noble Cars UK".